Sometimes allergy and free from food labelling leaves me scratching my head. 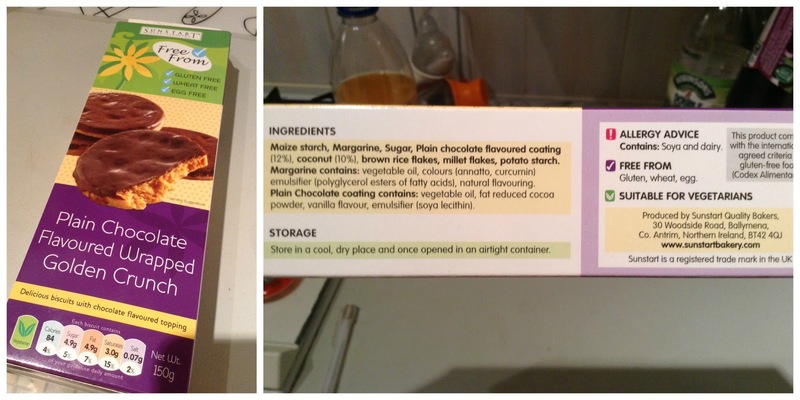 My Mum recently handed me a packet of biscuits saying "I've checked the ingredients you can eat these". However, we were confused why the Allergy Advice states "contains dairy". I can not find a dairy ingredient in the full list, Twitter folk seem to agree with me. I've emailed the company for an explanation but so far no response. I'm wondering if something is not being declared or the label should be "may contain". In response to a tweet from Dairy Free Baby & Me. These biscuits are labelled suitable for Vegetarians, I would assume E 475: Polyglycerol esters of fatty acids, would be derived from vegetable oils. On a happier note, I recently discovered the biscuits pictured below. 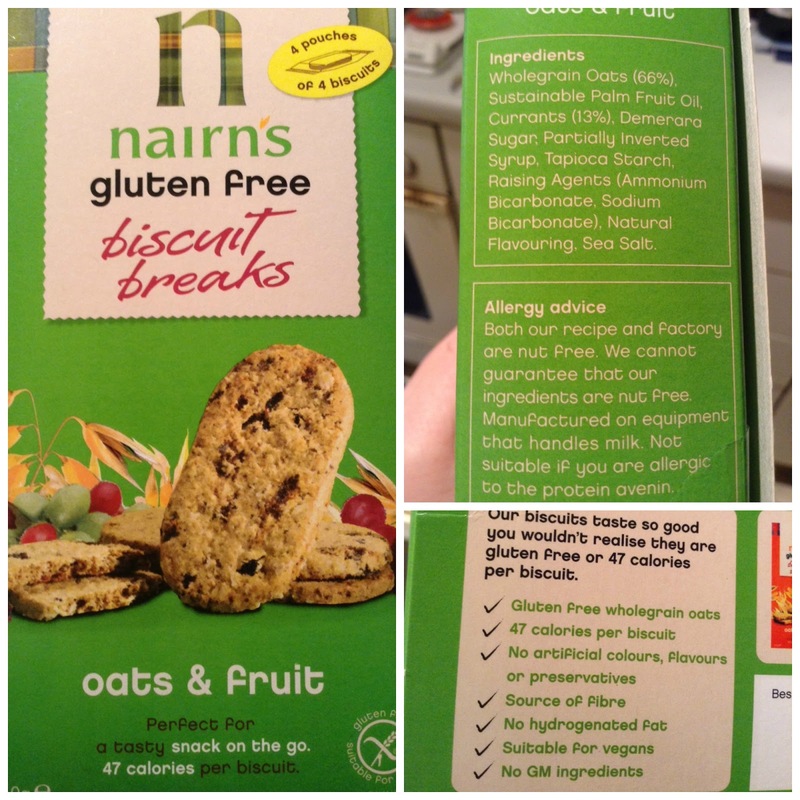 You may remember I wrote about new product launches only being Gluten Free and these fall into that category. I only know these are suitable for me from the labelling on reverse of the packet. My Tesco Clubcard is getting confused at my diet. They must think I've turned Coeliac because I'm getting coupons for Gluten Free products (e.g bread), which I don't require and can't always eat as they contain milk and eggs. I can only assume it's because I am buying products that are solely marketed as Gluten Free, that's what gets them in a muddle. Anyone else encountering similar problems to those raised here? Re the first biscuits - don't they contain margarine? It may be the natural flavouring? So frustrating! I know the FSA state that ingredients under a certain percentage of the total don't have to be listed. However they would still be present in enough quantity to cause a reaction. Shame on them for not being more diligent on a seriou subject! It could well be the flavourings. I'm not sure about the 'ingredients under a certain percentage' not having to be listed - but either way it's certainly not the case for the 14 food allergens which *must* be listed - and dairy is one of those. I still haven't had a reply from the manufacturer so it remains a mystery. Yes this happens to me the whole time. I read through the ingredients on a packet of something. Find nothing I can identify as dairy and then see in the allergy section that it 'contains dairy'. Frustrating as I'd like it be clear where exactly the dairy is coming from (as otherwise it can seem like a mistake) and then I tend to lose a little faith in the brand. On a kinda related note though, tried the raspberry biscuits recently from sunstart bakery and they are amazing! I've never actually encountered this because often I just look straight at the Allergy Advice because I find it's quicker than deciphering ingredients lists, otherwise I would no doubt come up against this same problem... The only thing I would question would be the margarine which can be vegetable based but still contain milk derivatives. Have you heard from them since? Dairy is not an intended ingredient, therefore not included in the labelling. The chocolate which we buy can be cross contaminated on the line so although it does not include dairy as an ingredient previous testing has shown amounts of casein and lactose higher then the limits specified to be dairy free so it must contain the warning. Testing on the last few batches of chocolate has shown a presence of dairy therefore we need to label contains Dairy to ensure that consumers are aware that dairy is contained within and to prevent anyone from becoming sick or going into shock. We are constantly striving to find a better substitute so that we can label Dairy free in the future. I think this is interesting on two levels. First, as I tweeted, I'd like to know what these "limits specified to be dairy free" are, as I wasn't aware there was a definition for them, as there is with 'gluten free' at 20 parts per million. Second, I wonder why they don't just put the contents of the letter on the labelling? It would be a great help to dairy sensitives - and indeed vegans. Thanks for drawing attention to this - and pursuing the manufacturer for the details.